There is no doubt that a Father’s presence in the home, along with his strong comforting hand is just what every child needs. For daughters, fathers are often their first loves setting the standard for future relationships. Sons are equally impacted by the presence of consistent male role models in the home. However, with the single parenthood on the rise, the number of women raising children alone has climbed to over 10 million. So, what does this mean for single moms who are raising young women and men without a father in the home? Do they have to play both roles in order for their children to become well-rounded, educated, contributing members of society? Are children in single parent homes lacking something? The answer is, NO! After all, our current President, Barak Obama was raised by a single mother. 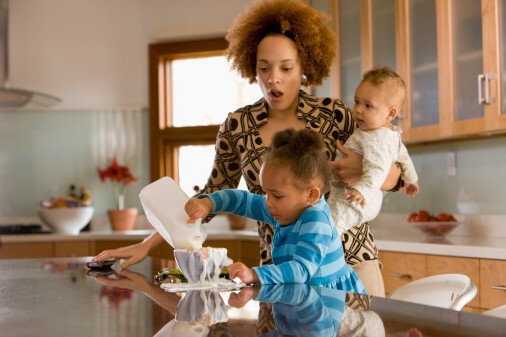 Studies show that women are quite capable of raising children on their own, if they have to. And they do so quite well without assuming both roles as often suggested in the media. that fulfill the basic human needs of each child to be feel loved, have a sense of belonging, and feel safe. Consistency: Children thrive best in environments where caregivers are consistently present and provide steady guidance with a firm and kind hand. Unconditional Love: Loving your child whether they perform to your expectations or not, you love them anyway. If they fail or fall, you will be there. Protection: Being there when the child is frightened or unsure creates a great bond between parent and child. This bond fulfills the child’s need to feel safe. Setting a Balanced Example: Children need to know that life is not all flowers and roses, that sometimes they will face adversity. As they observe how you handle the trials and tribulations of life they will adapt and mimic your coping skills. If you are a single mother, be encouraged. You don’t have to do twice as much to compensate for the absent parent. Parenthood is a journey of simple steps coupled with purposeful actions that yield amazing results over time. This is your personal journey and through your devoted efforts and love for your child/children–you will succeed.